By Day Three my biggest concern is my email - some hotel telephone systems think they can just put a phone with a modem jack in every room and viola! Well, my Windoze95 laptop tells me I've got a 50K connection, but it takes close to five minutes to download 2K of email messages. 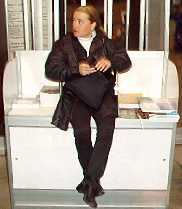 I know, I'll be home by Friday afternoon - but I need my email now! CAD-UL makes a C/C++ toolchain - editor, compiler, XDB debugger, with support for 3rd party operating systems for x86/Pentium and Motorola 68K processors. In one of the more innovative promos, they auctioned off a bottle of Dom Perignon champagne in a wood case with two crystal champagne glasses.The winner was Krista McKennah, a former Oakland Raiderette that was working the Treck, Inc. booth right next store. The Treck booth was well manned, uh, I mean, it was staffed by Treck employees and three women in Treck t-shirts, one of them the aforementioned Oakland Raiderette. Treck makes an embedded TCP/IP stack that is fully ROMable and is re-entrant. Treck is partnered with a company called SNMP Research International, who was also present at the booth; unfortunately, nobody could tell me what was the SNMP did. Now, as for the Best Giveaway, I've decided on a tie. MetaLink Corp., a manufacturer of cost-efficient in-circuit emulators, was giving out these neat little PC screen cleaners that kinda look like miniature automobile windshield cleaners. It seemed consistent with their emulator strategy: useful, no nonsense, easy to use. MetaLink has introduced two new in-circuit emulators for the Intel MCS251, two ICEs for Intel's 8x930 USB microcontroller, and the IM-CR16-SG for National Semiconductor's CompactRISC CR16. 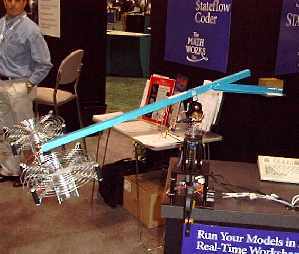 Tied with Metalink was Mentor Graphics-Microtec Division with their Space Pen. I was partial to the Space Pen because most of the pens I picked up at the conference immediately stopped working. Mentor had a projection-screen demo of their XRAY debugger which has OS support for pRISM+, ChorusOS, Windows CE, and others. What's interesting here is that XRAY supports Microtec's own VRX RTOS while supporting a number of 3rd party RTOSs as well. This is consistent with what I've been seeing from the other tool suite vendors that already have their own RTOS - they are including support for other RTOSs as well. The rising popularity of RTOSs in low-end embedded systems seems to be the cause of this. The MathWorks Inc.supplies a fully integrated algorithm development, simulation, and prototyping environment and supports C and Ada. Products such as MATLAB, Simulink, Stateflow, and Real-Time Workshop are targeted for control systems and was aptly demonstrated by their helicopter demo (seen left). This was an impressive display of control system design - no matter how you pushed or prodded the balanced beam, the fan blades adjusted their speed to return the beam to equilibrium quickly and efficiently. As a demo, it was an excellent way to showcase MathWork's applicability for control system design. CMX Company real-time multitasking RTOS supports a lot of embedded microcontrollers, from Atmel to Toshiba, and even some lesser known microcontrollers such as ST-Microelectronics' ST9/ST9+ and National Semiconductor's CR16 CompactRISC. To insure interoperability, CMX has tested and supports over 30 compiler vendors. Both CMX and MathWorks, along with Microcontroller.com, are in Boston Massachusetts, the high-tech region of Eastern U.S.
Questra Consulting had a small booth that belayed the size of their company - over 230 engineers. Questra's team of engineers are equipped to provide a wide variety of services. Embedded development is just a subset of their capabilities as they have expertise in multimedia, digital imaging, networking, and industrial control. There are a few players in the embedded Java® market, but those I spoke to didn't seem to be very focused. When asked about what applications and systems embedded Java would benefit, the answer I got was "wherever the benefits of Java can be taken advantage of". I had a flashback to similar discussions I'd had years ago with manufacturers of fuzzy logic tools. I wish I could have reported on more of the exhibitors, but there always seems to be less and less time available to check the exhibits, as schedules fill during the week. 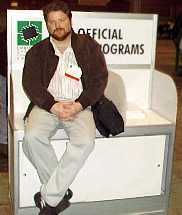 I've been going to the Embedded Systems Conferences since 1989, and have missed very few. But one thing I've noticed - the face of the conference is changing very subtly. Internet technologies and communications protocols are gradually becoming more prominent. On the one hand, the general feeling here is that embedded internet will not be a fad - it is here to stay, and many of the tools vendors were scrambling to form partnerships with developers of embedded internet protocols. On the other hand, people were hard pressed to come up with good examples of a TCP/IP stack in a microcontroller other than the printer on a network example. In conclusion, as usual the Embedded Systems Conference was informative, educational, and entertaining. Miller-Freeman always insures that the needs of the exhibitors are met and that the conference's attitude is conducive to the networking that these sort of shows are known for.